ROLES:There are five types of player roles in Sea Dracula! : Lawyers, Jurors, Court Reporters, Bailiffs, and Band Members. There is room for an unlimited number of jurors. Jury members will be called on to gather evidence before the trial, to serve as witnesses, and to have a good time. The first two are volunteer assignments, the last is mandatory. There is room for 1 or 2 Court Reporters. Their job is to make sure news of this trial gets out to the people of Animal City. COSTUMING:The animals of Animal City are as varied as the feathers on a snake! Some paint their faces to look like more fashionable animals, some wear masks so they can pull them off and go “boo!”, and some just look like hairless apes in blue jeans and fancy glasses. ACCESSIBILITY:The play venue is a split-level home, with stair access only. The venue is accessible by public transit, with around 1 block of walking from the nearest bus stop. 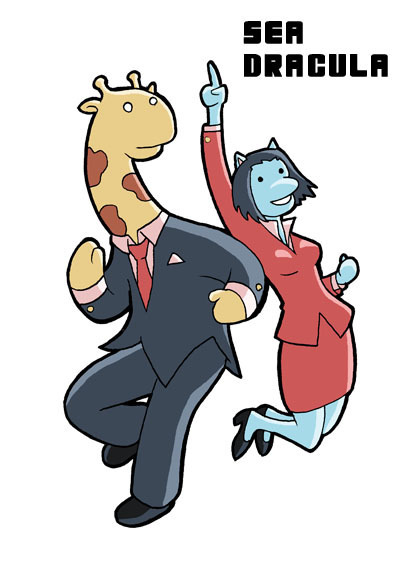 The game requires dancing for lawyers, which is non-negotiable. The content of the game aims for silliness, and will strive to avoid making people uncomfortable or sad. For more information about Sea Dracula! email larphouse@gmail.com. Your inquiry will be forwarded to the person best suited to answer it.